Carmel Farmstay is the ideal retreat, centrally located we adjoin a challenging rural golf course (visitors welcome) and it is an easy drive to Waitomo ,with its variety of caving experiences, between passive and adrenaline-rush. - Shopping for New Zealand clothing and souvenirs in Waitomo. - Explore the Pureora Forest park and Tongariro National Park and Whakapapa ski area as a day trip. - Only minutes to the iconic Fat Pigeon Cafe! - Bask in the sun around the pool or take a leisurely stroll through the gardens. - Take a ride on the Pureroa Timber Trail mountain biking tracks; The nearby Timber Trail is one of the 23 accredited cycle trails. - Or, for a slice of paradise, the nearby Mangaotaki Valley is home to trout fishing and the world renowned movie site of Sir Peter Jackson's Hobbit film location. - Visit the delicious Piopio Berry Orchard. Carmel Farmstay will leave you feeling relaxed and rejuvenated. Explore a working dairy farm with your hosts. Meander through limestone rocks and green pastures. Our established homestead with modern living, surrounded by green pastures and rural farmland makes our property an easy choice. We welcome all guests and share country hospitality whilst ensuring your stay exceeds your needs. 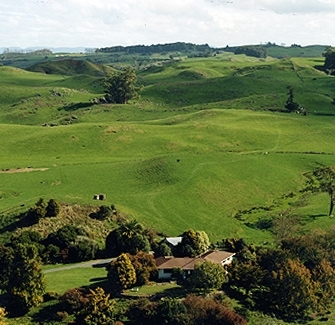 Our B & B is truly a restful break for anyone travelling New Zealand or wanting a weekend away. Join Leo and Barbara Anselmi in their well-established homestead in rural King Country surrounds, set in a picturesque limestone valley. You will be treated to delicious home-cooked meals and the warmth of our friendship.